How Long Should I Wait to Change My Nose Piercing? You shouldn’t change your nose ring until your piercing has finished healing. Unfortunately, that might take a little while. Nose piercings take longer to heal than most other common piercings. The reason has to do with your circulatory system: there isn’t much blood flowing to your nostrils, and that slows down your healing time. If you have a pierced septum, you can expect it to take about six to eight weeks to heal. 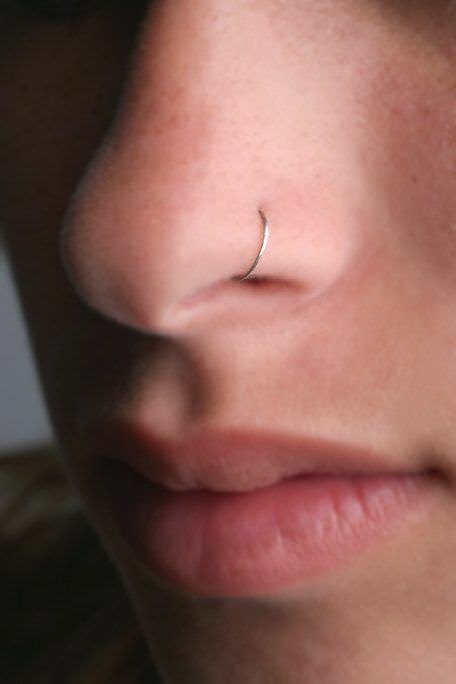 If you have a nostril piercing, it should be around two to four months. Following your aftercare routine will not only prevent infection but should also speed up your healing time. If you haven’t been practicing proper aftercare, you might be looking at a longer than average healing time. Once the standard healing time has passed, evaluate your piercing. If it looks like your skin’s gone back to normal, you’re probably ready to change your nose ring. If there is swelling, redness or other forms of discoloration, or any discharge from the piercing, leave it alone for the time being. Those are signs that it hasn’t finished healing. Be careful when going by appearance alone: piercings can look completely healed on the outside even if they haven’t finished healing on the inside. If you’re allergic to the material your stud is made of, it will take longer to heal. Essentially, your body will be trying to heal the site while it’s also battling irritation from the allergen. If your healing is taking far longer than expected, or you experience complications while healing, ask your piercer about changing to a stud made from a different material. If you still can’t tell whether your piercing has healed, or you want to be extra certain, ask your piercer to take a look at it. They’ll be able to tell you whether you’re ready to swap out the nose stud or need to leave it in a little longer. If you got pierced at a mall kiosk or a jewelry store, you should still go see a professional piercer if you have any questions or concerns. They might not have done your piercing, but many will be happy to help you out, especially if you buy your new jewelry from their shop. Your piercing is a sensitive and vulnerable area while it’s still healing. Taking the stud out too soon puts you at risk of infection. The piercing could also become swollen or tear and bleed. Even after your piercing has finished healing, you need to be cautious. It will be very tight at first, so you need to be careful when easing the jewelry in. Never push it through when it doesn’t fit comfortably; it could result in tearing. You’ll have the same problem if you try to insert jewelry of the wrong gauge. 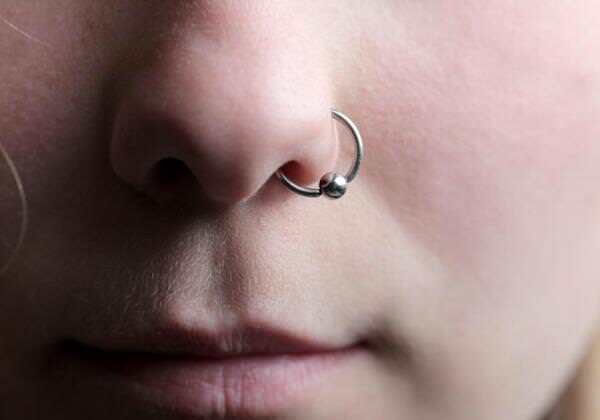 Changing your nose rings without first making sure that your hands and the jewelry are clean will also put you at increased risk of infection. Once your piercing has finished healing, it’s finally time to replace your old jewelry. Wash your hands thoroughly. Never skip this step or your piercing might become infected. Using disposable rubber gloves will also do the trick. Remove your current nose stud. There are different types of nose studs, but most of the ones piercers start you off with can be simply eased out by gently and slowly pulling it through. Make sure your piercing and jewelry are clean. Remove the bead on your new nose ring or pull it open (depending on the model). Gently and carefully slide the thinnest end of the jewelry into your piercing. Proceed slowly and stop if you experience any pain. Close the jewelry. If it is a captive ring (held in place with a bead), replace the bead. Consult a professional piercer if you experience any problems or complications. Don’t force a piercing through, decide to just put up with the pain, or ignore injuries or problems that arise when changing your nose ring. Get advice from a professional before things get worse. Changing a nose ring shouldn’t be intimidating. If you make sure your piercing is fully healed before proceeding and follow the simple instructions from this article, you’ll be ready to enjoy your new jewelry.